I was recently asked to participate in a ghost walk to benefit the Historic Batavia Cemetery in Batavia, NY. Knowing as they do my interest in the Civil War, I was asked to portray Gen. John H. Martindale. The name was vaguely familiar, but I was surprised that he was buried in Batavia; I would have guessed Rochester. 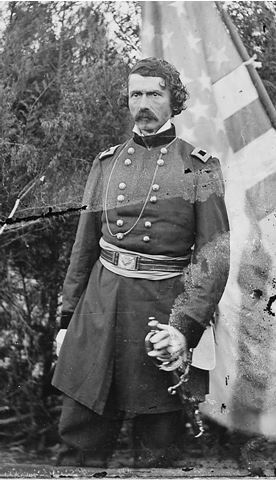 But what surprised me most was that here was another Union General, who rose to the rank of Major General (brevet), and you never heard him being celebrated; Gen. Emory Upton garnered all the attention in Genesee County. In fact, there is a large memorial to Upton’s memory in downtown Batavia at a busy intersection. 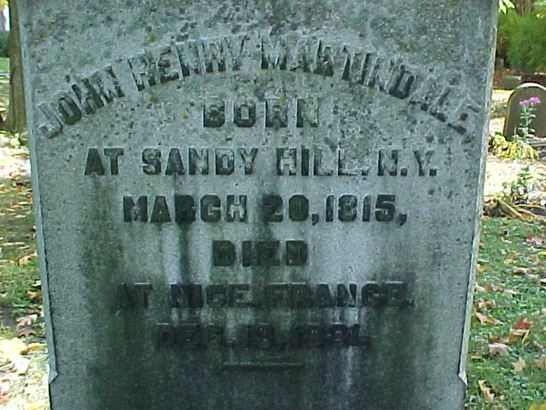 Born March 20th, 1815 in Sandy Hill, NY, Martindale grew up in Washington County, NY. His father, Henry C. Martindale was a U.S. Congressman. John Martindale entered the U.S. Military Academy at West Point in 1831 and graduated third in his class in 1835. Although he got a brevet promotion to Second Lieutenant in the First Dragoons, a sought-after assignment, Martindale resigned from the service to take up the law. In 1838 Martindale opened a law office in Batavia, NY and quickly established himself as a skillful attorney and talented orator. According to the “Gazetteer and biographical record of Genesee County, N.Y., 1788-1890, ” Martindale was “always eloquent, [and] he had the faculty of being most so in cases otherwise commonplace.” Twice elected District Attorney for Genesee County, Martindale’s pre-war career is most notable for his advocacy for the Tonawanda Native American tribe of Western New York alongside Ely Parker. When the war commenced, Martindale reentered the army and was commissioned a brigadier general. His first six months found him manning the defenses of Washington, DC. In the spring of 1862, Martindale was serving in the first brigade of Gen. Fitz-John Porter’s division during the Peninsular Campaign. Near the end of the campaign, he was struck down with typhoid fever. While convalescing, Martindale returned to Western New York for a time and gave a number of recruiting speeches. Returning to service, Martindale was appointed Military Governor of Washington, DC. and gained a brevet appointment to Major General. In the spring of 1864, he joined Gen. Benjamin Butler’s Army of the James as Union forces closed in on the Confederate Capital of Richmond. Not long after, Martindale succeeded Gen. W.F. Smith as commander of the XVIII Army Corps. outside Petersburg. Unfortunately Martindale was forced to resign his commission in the fall of 1864 due to ill health. Although not yet diagnosed, Martindale was suffering from Tuberculosis, which slowly sapped his strength and often prostrated him. Returning to the Rochester area, Martindale again took up the law and was subsequently elected the Attorney General of New York State. Gen. Martindale died in December 1881, at the age of 66, while on vacation in the south of France, where he had gone in search of a climate that would be conducive to his health. His body would be returned to New York and interred in the Batavia Cemetery. “In private life General Martindale was greatly esteemed,” according to the “Gazetteer and Biographical Record of Genesee County, N.Y., 1788-1890,” “his character was above reproach, and he was a man of sincere piety.” Although Martindale was not known for innovative tactics during the war, though he had his share of heroic action during the Peninsula Campaign, his service was less notable, perhaps, than Emory Upton’s. But when you consider Martindale’s service to the Tonawanda Indians, the assistance he offered to Ely Parker, and his election as the Attorney General of New York State after the war, his achievements over his lifetime certainly should earn him a place beside Emory Upton in the hearts and memories of the people of Batavia and Genesee County. This entry was posted in Armies, Battles, Campaigns, Common Soldier, Leadership--Federal, Memory, Personalities and tagged 1st U.S. Dragoons, Army of the James, Benjamin Butler, Emory Upton, Fitz John Porter, John Martindale, Penninsula Campaign, Petersburg, William Smith, XVIII Corps. Bookmark the permalink.